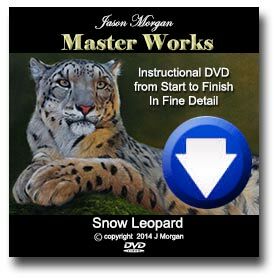 How to Paint Animal Eyes video DVD discs out now! Have you always struggled to paint realistic eyes? Or do you want to improve your techniques even further? If so my NEW “Painting Eyes Master Class” is for you! Watch EVERY BRUSHSTROKE + PAINT MIX! Plays on all dvd players. Ships all over the world airmail. Come on join my wildlife art on Facebook page for all my latest news. tips and techniques. 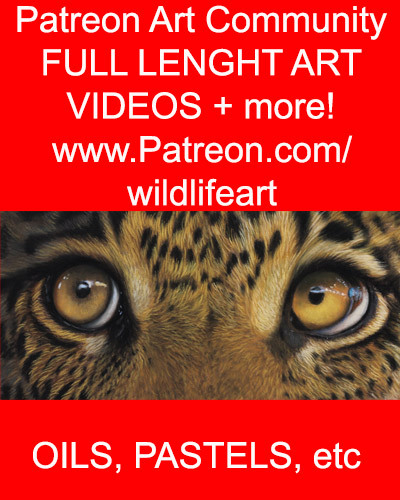 New Leopard wildlife art video out today! Just released a new video – This painting Video is something VERY different! I have compressed the whole 9 hours it took me to complete the painting and used modern video technology to speed up and compress the whole process in to a 1 hour film. With my voice over explaining what I am doing throughout. Brand New Release 2014Almost 8 hours of Video! Have you always wanted to watch a Professional Wildlife Artist paint? Seeing EXACTLY how he does it, IN REAL TIME? Well now you can do just that! For my NEW painting video I set up some video cameras and recorded every single minute of painting, including the mixing of colours, it’s all here! Thank you to Tamby for the great ref photo used to create this painting. New Leopard Painting – for sale today!